Industry's best aperture ring covers a 8-stop range, clearly indicating actual number of f-stops. No more guesswork! (Patent granted). Increase maximum aperture by 1 1/3 stops. 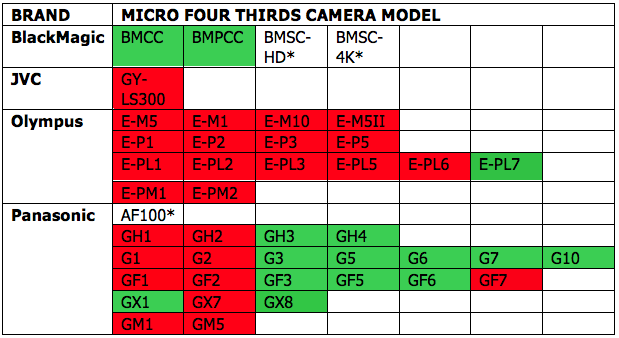 Support Panasonic GH5, GH5s, GH4, GH3, G3, G5, G6, G7, G9, G10, GF3, GF5, GF6, GX1, GX8, GX80/GX85, GX9, Olympus E-PL7, Blackmagic Cinema Camera with Micro Four Thirds mount, Blackmagic Pocket Cinema Camera, Blackmagic Pocket Cinema Camera 4K. The tripod foot is detachable and compatible with Arca Swiss, Markins, Photo Clam ball heads. Disclaimer: we are NOT licensed, approved or endorsed by Micro Four Thirds or Nikon.